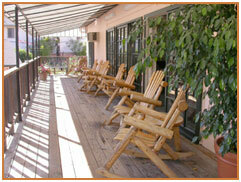 *** Our 6 "Creekside" Rooms DO NOT have A/C All other rooms do have Air Conditioning. Creekside rooms have front and back screened doors that allow the cool evening and morning breezes to flow through as well as fans. WE ARE A PET FRIENDLY, Must call us DIRECTLY, there are restrictions and limited availability. 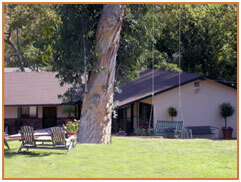 Welcome To Peach Tree Inn! We are ahead of our competition in helping to save the planet's resources by recycling heavily and encourage other hotels to do the same. STEP BACK IN TIME & ENJOY COUNTRY STYLE HOSPITALITY. We are a Local Family Owned and Run Business. Our Family has lived in San Luis Obispo for more than 40 years, Proud Cal Poly Alumni. ONLINE RESERVATIONS are Available 24hrs a day, 7 Days a Week, 365 Days a Year! If you would like to book a room over the phone, PLEASE CALL BETWEEN THE HOURS of: 8:00AM - 10:00PM and we would be happy to assist you in making a reservation here at the Peach Tree Inn. Children 12 and under stay in rooms with existing beds at no charge. Please make sure you check the maximum occupancy when booking a room. If in doubt please give us a call. 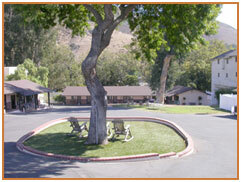 The Peach Tree Inn is a home-style inn with a "BED & BREAKFAST FEEL" centrally located in friendly San Luis Obispo, California. Our caring front desk staff know San Luis Obispo well and are eager to assist you in making your stay most enjoyable. Lose yourself in our peaceful, majestic surroundings. Green grass, rose gardens, mountain views, a tree swing and benches are strategically positioned to afford you the utmost in relaxation. All of this in a secret little pocket of peacefulness - just a hop, skip and a jump from downtown. Mornings are special in our large breakfast room. We're up early to prepare an ample continental breakfast, including fresh Locally Baked breads, fruit, juice, hot and cold cereals, coffee, tea and more. Our coffee is the best on the street, we grind our own beans in back! Visit with new friends, browse the net, take your coffee out on to the porch to drink in the mountain views or simply enjoy the hummingbirds as they dazzle and delight. Located on the edge of town, the Peach Tree Inn allows visitors the ability to carry on business-as-usual or to escape from the hurried world. 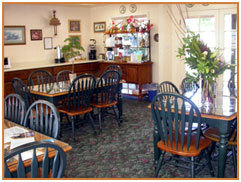 Known for our hospitality, the Peach Tree Inn offers modestly priced rooms with at home feel. The wine country, Hearst Castle, beaches and specialty shopping are only minutes away and discounts are available for AAA and AARP members as well as mid-week/off-season bookings. Cal Poly : Cal Poly is a nationally ranked, four-year, comprehensive public university located in a mile from the Peach Tree Inn. The emphasis of the University is a "learn by doing" educational experience for its more than 18,000+ students. Many students seek admission to Cal Poly not only because of its excellent academic reputation, but also because the 6,000-acre main campus is nestled in the foothills of San Luis Obispo, just minutes from California's Central Coast beaches. Cuesta College: Cuesta College is located at the heart of scenic San Luis Obispo County, and is highly regarded throughout the state for its excellent educational programs, responsive student services and exceptional faculty and staff. Wine Tasting : Welcome to the SLO Life! You know you are in the heart of wine country. Back country roads lined with vineyards, rolling hills, a light breeze and blue, blue skies. An unhurried and unpretentious wine tasting getaway awaits. Midway between San Francisco and Los Angeles, the San Luis Obispo wine region is comprised of three pristine viticulture areas: the Edna Valley, Arroyo Grande Valley and Avila Valley. Small, mostly family-owned wineries are well known for their hand-crafted bottlings of Pinot Noir, Chardonnay, Syrah, Grenache, Viognier, Zinfandel and more. Farmers Market SLO every Thursday night : Barbecued ribs, fresh produce, arts and crafts, and live entertainment... it's San Luis Obispo's lively Farmers Market! Held every Thursday night, Farmers Market is a street fair and produce market. Locals and visitors alike can shop for the county's freshest produce and flowers, devour delicious ribs and sandwiches, browse local shops open late and enjoy live entertainment. Recognized as a leader of such activities in California, Farmers Market is held on six downtown blocks of Higuera Street, between Osos and Nipomo streets. The area is closed to all through traffic to make room for this fabulous event. Please note that City Ordinance prohibits dogs from attending so please leave your four-legged friends at home. Look out for a six-foot bear - that's mascot "Downtown Brown" giving out hugs and paw shakes to Market-goers. Hearst Castle: William Randolph Hearst hired renowned architect, Julia Morgan to create his enchanted mountain top retreat in 1919. By 1947, Mr. Hearst had created an estate boasting 165 rooms and 127 acres of gardens, terraces, pools and walkways. This legendary California manor sits at 1,600 feet above sea level; often appearing to float in the clouds amidst the coastal fog. Hearst Castle® presents guests with a choice of five different guided tours, including daytime and evening opportunities.